For more see: The Stock Market "Always" Bounces Back Right? 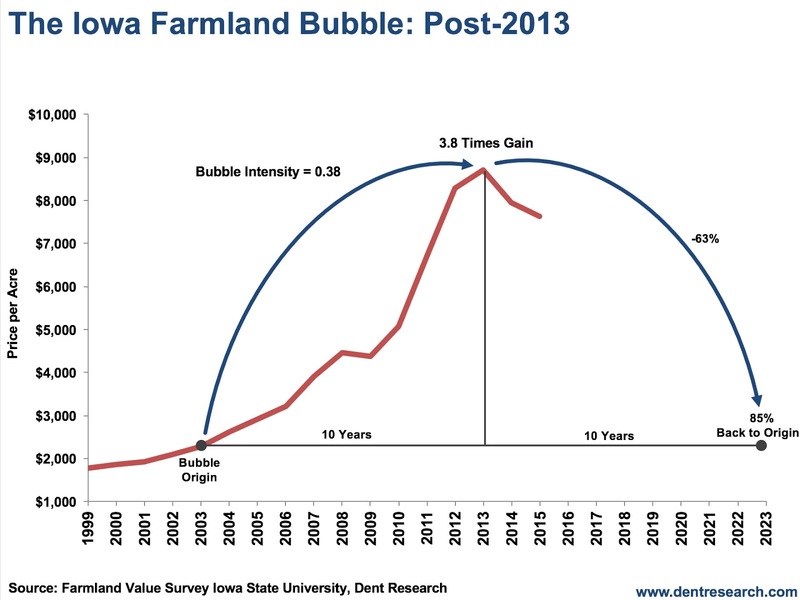 It was amazing to watch farmland prices skyrocket as residential real estate was falling from 2008 to 2012. Now that the market has hit a peak, it will be interesting to watch how far prices falls back to earth. For years I have argued that ultra-low interest rates act more as an economic sedative than a stimulant. This idea has elicited laughter from the economic establishment. But it is becoming clearer that rates set by central banks that are far below the levels that free markets would have otherwise determined have dragged the world into the economic mud. The simple proof is currently arising in Europe where negative interest rates are now transforming companies from agents of growth, production, and employment into financial sloths that exist solely to borrow money. In a September 7 front page article, the Wall Street Journal reported that as of September 5, €706 billion worth of investment-grade European corporate debt, or roughly 30% of the market, according to trading platform Tradeweb, was trading at negative yields, an increase from just 5% in January. These negative yields were the result of intense activism on the part of the European Central Bank (ECB). For years the ECB had been trying to stimulate growth by buying trillions of euros’ worth of sovereign debt. But as these programs proved ineffective to wake up the EU economy from its long economic slumber, this year they began moving into the corporate market. Most of this buying has occurred on the secondary market, for bonds that had previously been issued at positive rates. The central bank buying raised prices of these bonds sufficiently to push yields into negative territory. It also has drawn in speculators who have bought low yielding bonds not because they are good investments but because they are convinced that the ECB will one day buy them out at a premium. But the real news of that Journal article was that for the first time, major European firms like German manufacturer Henkel AG and French drugmaker Sanofi SA had issued corporate bonds at negative rates in the primary market. This means that if they are held to maturity, the bonds are guaranteed money losers…in essence, the companies are being paid to borrow. This is a stunning development that alters the fundamental principles of corporate strategy. As this process of ECB corporate bond buying continues, more and more companies will follow suit and issue bonds at negative yields. Why wouldn’t they? It’s nice work if you can get it. To seek profits, why go through the laborious and uncertain process of developing new products and seeking new customers when all you have to do instead is simply borrow money from lenders and pay them back less? It’s fool proof, requires no messy union labor contracts, no R&D, and is infinitely scalable…as long as the central bank keeps buying. All indications are that they will. With such an easy path to profits, it should come as no surprise that this August was the busiest on record in terms of European corporate debt issuance, according to Dealogic. But what are the companies doing with the newly raised cash? They aren't using it to hire more workers. Another story in the same Journal edition detailed how European corporate investment spending stalled at 0% growth in the second quarter (Eurostat data). Rather than investing the money, companies are using the brisk bond issuance to retire older debt, pay dividends, or buyback shares on the open market. While these activities are great for shareholders, they provide very little benefit for workers and consumers. Welcome to the new economy. Normally, if a company borrows cash at a positive rate of interest, it must put that money to some productive use in order to repay lenders both principal and interest, plus generate a profit for its efforts. But now that hurdle has been eliminated. Companies don’t need to create any value with the money they borrow. They just need to borrow. The loans themselves produce the profit. It’s not too difficult to see how the corporate sector will evolve if the “ECB buying at negative rates” trend continues, or picks up steam. Corporations will focus less on business operations and more on ways to increase debt issuance. Fewer engineers and more accountants is never a good recipe for economic growth. But it doesn’t stop there. The BoJ has also become the principle buyer of the Japanese stock market and now owns more than 60% of Japanese ETFs. Clearly, those stock purchases are not motivated by the same market-focused rationale that would compel private investors. Such “investments” are not spurring the Japanese companies to make bolder investments into organic growth. Instead, they are more likely to sit back and let the money roll in. It’s corporate welfare at its worst, guaranteed to produce nothing but short-term profits. But despite all of this, the politicians, central bankers, and economists insist that bolder and more creative techniques of money printing and financial stimulus will unlock the economic puzzle and return the global economy to 3% or 4% growth. I think there is little doubt that the Federal Reserve will ultimately follow the ECB and the BoJ into this bizarre world of negative yields and unlimited financial asset purchases. But as we go down this road, no one in power seems to consider the possibility that “stimulus” does more harm than good. If central banks weren’t buying bonds, interest rates would surely rise, and risks for business and governments would return. But the real world can produce real results. It has worked that way for millennia. Without guaranteed government money, companies would need to attract real investors. To do that they would need to create real businesses, a process that takes investment, innovation, and efficiency. These are the essential elements that create productivity growth that is the single biggest factor in raising living standards. It’s no accident that productivity growth has all but disappeared in the current age of central bank activism. So we have a choice, either we continue down the road of negative rates to Fantasy Land, where central banks own all the stocks and bonds and asset prices always rise, but real wages and average living standards always fall, or we take our chances on a different path that leads to reality, however unpleasant the transition may be. I for one would choose the latter, but it looks like I won’t have much company.